Preheat oven to 180°C. Mix together butter, almonds, rosemary and lemon rind in a bowl and season to taste. Gently run your fingers under the skin of the chicken to create pockets and place a quarter of the almond mixture inside each thigh. Secure with toothpicks. Heat half the oil in a roasting pan over medium heat. Add the chicken maryland and cook for around 3-4 minutes on each side or until browned. Add the potatoes and garlic bulbs, arranging them around the chicken. Add the extra rosemary sprigs and drizzle over the remaining oil, then season. Roast for 45 minutes or until meat is cooked through and the potatoes are tender. Brush lemon halves with a little oil on the cut side. Char on a grill or frypan over medium high heat, until lemons are heated through and nicely blackened on the cut side. 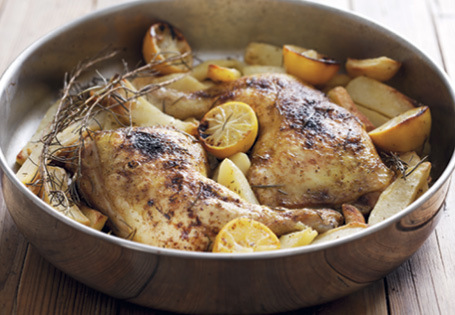 Serve chicken still in roasting pan, adding charred lemon.